Civil engineering contractors have today called on Government to promote a more collaborative rail sector in order to deliver a world-class railway. 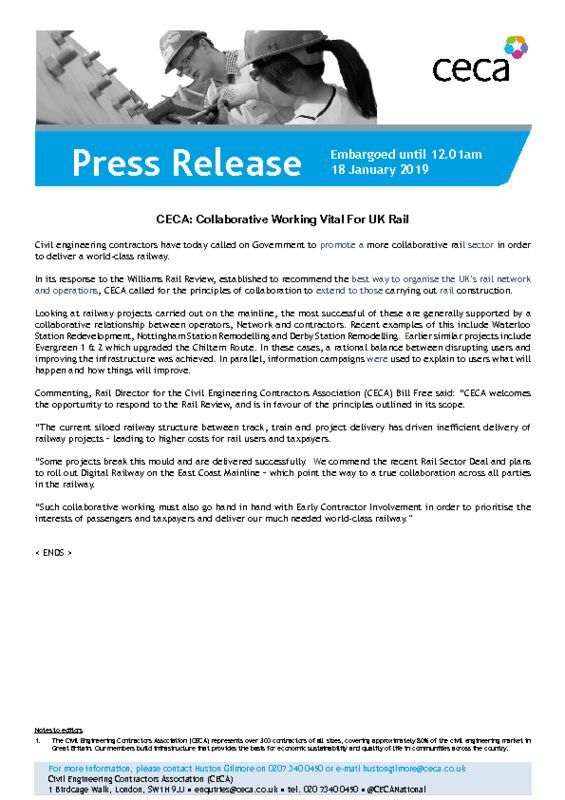 In its response to the Williams Rail Review, established to recommend the best way to organise the UK’s rail network and operations, CECA called for the principles of collaboration to extend to those carrying out rail construction. Looking at railway projects carried out on the mainline, the most successful of these are generally supported by a collaborative relationship between operators, Network and contractors. Recent examples of this include Waterloo Station Redevelopment, Nottingham Station Remodelling and Derby Station Remodelling. Earlier similar projects include Evergreen 1 & 2 which upgraded the Chiltern Route. In these cases, a rational balance between disrupting users and improving the infrastructure was achieved. In parallel, information campaigns were used to explain to users what will happen and how things will improve. Commenting, CECA Rail Director Bill Free said: “CECA welcomes the opportunity to respond to the Rail Review, and is in favour of the principles outlined in its scope. “The current siloed railway structure between track, train and project delivery has driven inefficient delivery of railway projects – leading to higher costs for rail users and taxpayers.